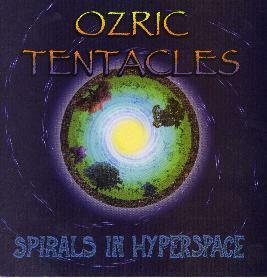 Ozric Tentacles - "Spirals in Hyperspace"
It has been a long wait for this new Ozric Tentacles CD. We were teased with one new Studio track with the Pyramidion CD-EP, but due to the bands label Stretchy falling apart and Simon Baker, long time manager leaving and some other bad dealings, the band had a long stretch without a studio record, but now it is here. While all this time has gone by it seems to have allowed this record to evolve into an Ed Wynne solo CD, with Ed being the only member performing on all the tracks and the rest of the members of the band playing only on selected tracks. Many have complained that the Ozric Tentacles CDs all sound the same. Well, they will not say that about this CD as Ed has taken the Ozrics further out into the electronic music realm than they have ever travelled before. Only 3 tracks have Schoo playing live drums and Zia only plays bass on one track, all the rest is programmed (very good programming). This is not really rock music anymore but a journey into electronic space music. "Chewier" opens the CD with some really cool synthesizer loops and bass lines. Amazing sound and a real tribal groove upon which Ed layers all kinds of cool sounds and synths and of course some ripping outer space guitar about 2 minutes in! There are a lot of Middle Eastern influences on this CD and sonically it is the most amazing especially in the headphones. "Spirals in Hyperspace", the longest track on the CD (9:51), is next and is a much more laid back groove with some synths and leads that remind me of the Nodens Ictus chill out stuff, but the programmed drums are much more manic. It gets a bit jazzy in the style that the keyboards are playing. At the 8 minute point the song really goes out into hyperspace with some great guitar over the top of the throbbing bass line. "Slinky" is a heavy synth song which starts with a really funky groove and new age style keyboard before it mutates. "Toka Tola", the title that was announced for this CD a couple of years ago, but obviously not used is next. I really think it is too bad that Schoo did not play drums on this track as it really could have used real drums. It is a building track that the layers of synths float and groove on and then Ed sneaks in with the supersonic guitars. This one will be excellent live. "Plasmoid" has a great techno funk synth loop that Ed then layers guitars on and some ripping leads as well. A short (5:17) but potent track. "Oakum" was only released as a fan club only CD and this is quite a different version and the only rock song on the CD. This improves upon the original version and is total full on intense psychedelic space rock! Amazing stuff. "Akasha" really reminds me of the Nodens Ictus material a lot with this gliding mellow synth layers but with more uptempo sampled drums and percussion. It also features Steve Hillage (GONG, System 7) on guitar and Miquette Giraudi (System 7) on synthesizers. I was trying to figure out what guitars were Ed and what guitars were Steve. I believe it is Steve who does the delay guitars for the most part of the first 4 minutes of the song and then Ed plays the guitars at the end. Some parts of this song remind me of Pyramidion. The synthesizers are very lush on this track. Next up, Merv (Eat Static, Ex-Ozric Tentacles, Dendron) is back with Ed to create a very freaky song and unlike anything else on the CD. "Psychic Chasm" begins with Nodens Ictus like keyboards and beautiful acoustic guitar and some samples. It gradually morphs into an electronic tripped out but not frantic techno track. "Zoemetra" ends the CD and features most of the band. It begins with some incredible acoustic guitar played in a mid eastern style. Schoo plays really tight and interesting drums. It is too bad he is not on more of the tracks. This is the longest CD the band has made since Erpland and another incredible sonic journey out of this world and into another one for 70 minutes! Totally mind blowing electronic music for the 24th century! For more information you can visit the Magna Carta web site at: http://www.magnacartarecords.com.